Often on Friday night I find myself with a huge burst of domestic energy. That’s one of the reasons I do my weekly planning sessions on Friday night – I know I have the whole weekend in front of me, fresh with possibilities and fun things to do around the house. 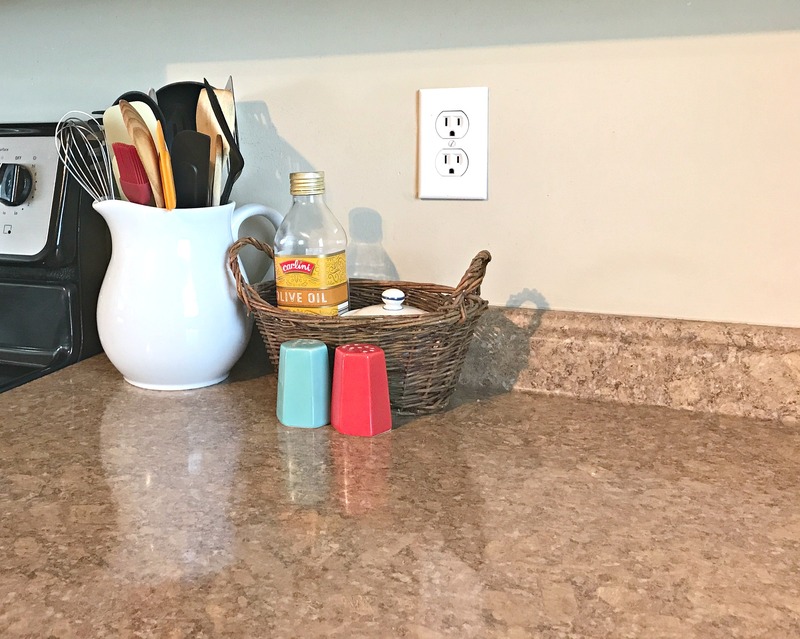 Early last week I decided that I was tired of the way my kitchen counter looked. I’ve had the same knife block and utensil holder crowding my counter for over six years, and I wanted a change. I decided to ditch the knife block, which meant I needed to make room for the knives in my utensil drawers. I organized those several years ago and the system was still working well, but this project required some rearranging. I ran over to Dollar General and picked up three sets of organizing bins (they were $.90 each!) and got started. Of course I can’t find a good picture of my counter the way it was all those years (probably because it was ugly and I didn’t want to photograph it!). 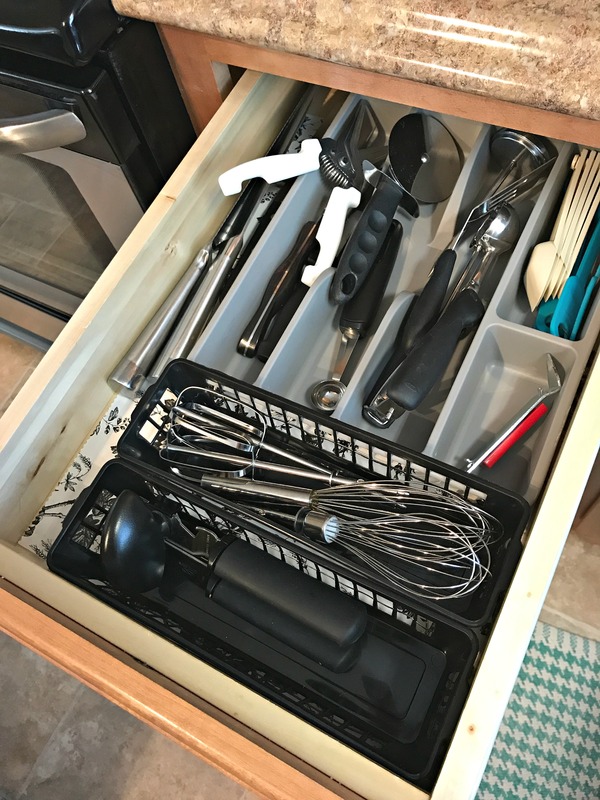 In less than 30 minutes I had clear counters and beautifully organized drawers! I’ll take you through the process in my video below – you’ll see that I had a few embarrassing discoveries along the way. LOL. Here’s the finished product – I love walking into the kitchen and seeing this beautiful sight! I’m catching up on posts today 😉 I have so many things that I’ll want to re-organize as a newlywed! Thank you for the inspiration and I love the Dollar Tree organizers! I did the exact same thing one afternoon. I was tired of the clutter and just cleaned and purged and my counters have been so tidy every since. I am loving the clear space!! So nice! I love your jug for utensils. 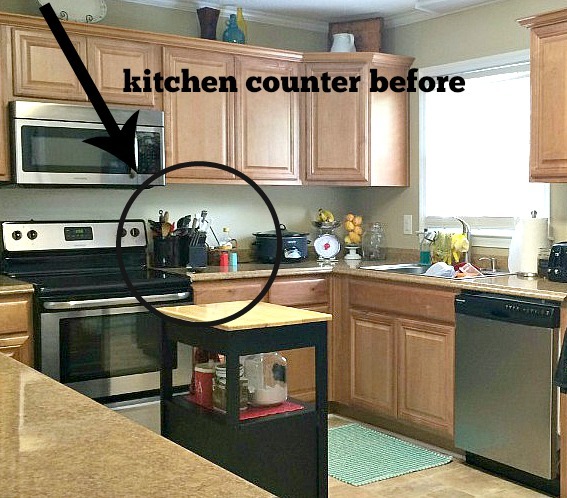 I hate how cluttered my counters are, too. I have several canisters for coffee, flour, etc, two coffee makers, dish rack, toaster, utensils, bread and cutting board…. It’s too much! But we’re low on cupboard space. But this post has me thinking what I can change … thanks! I totally get that! I am thinking about purchasing a blender, but I don’t have room for it in my cupboards…and I don’t want another thing on my counters. Hope you can find a solution! The clutter war will never be completely over, I’m afraid! 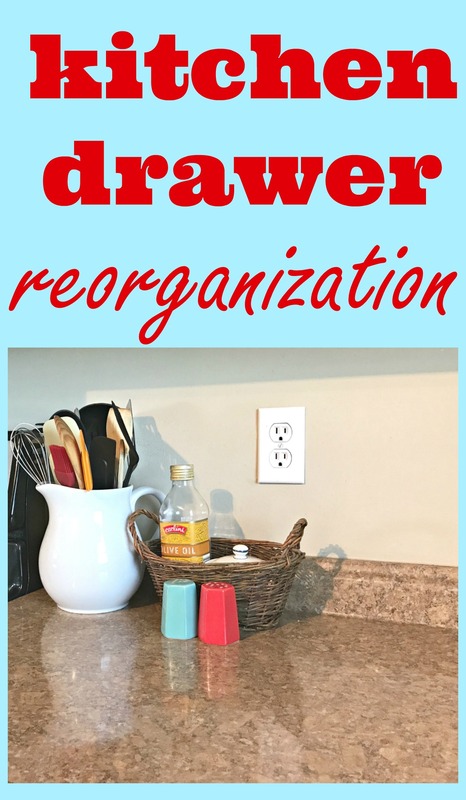 🙂 I use Tupperware every day, so I had to come up with an organizing solution for that drawer. I’m so glad I did it! I’ve been clearing off my counters, too!! I love having less stuff out so I moved my recipe box and rearranged where things were. 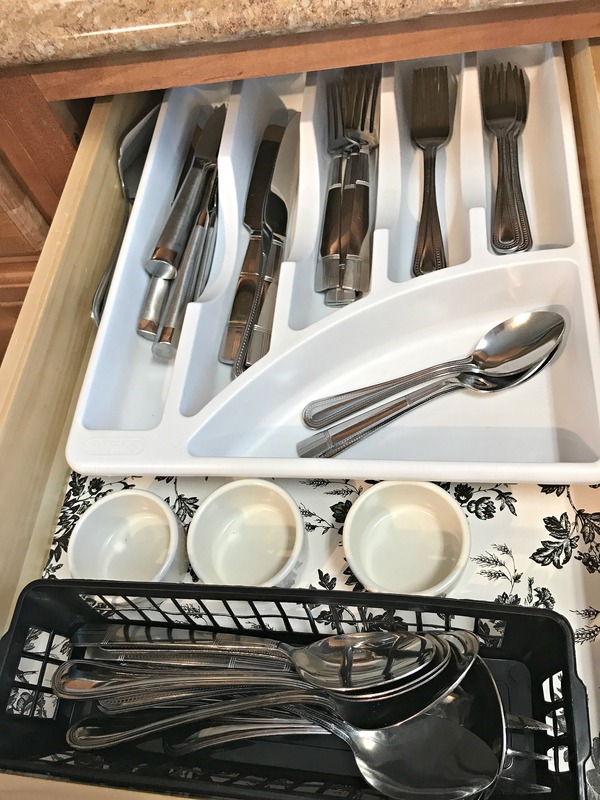 My utensil drawers could definitely use some organizing and purging this Spring. I LOVE how organizing bins give everything a place and really help to keep the chaos contained. It looks great! It’s amazing what a difference those little bins make! Thank you!